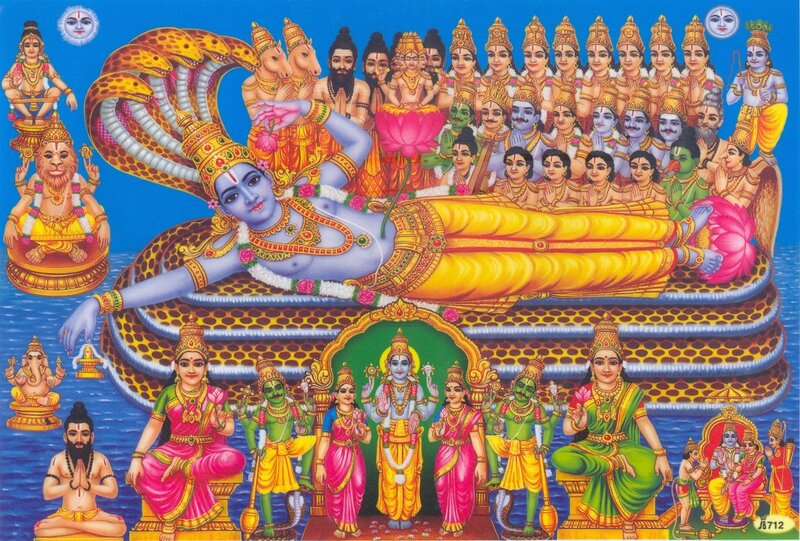 In this part we will explore the meaning of the 52nd Shloka of Sri Vishnu Sahasranamam. Bhagavan is the Centre of or fulcrum of the Universe and enlightens everything with His effulgence. He has the Sudharsana Chakra with a thousand spokes which He uses it to control, guide and direct everyone towards the path of Dharma. 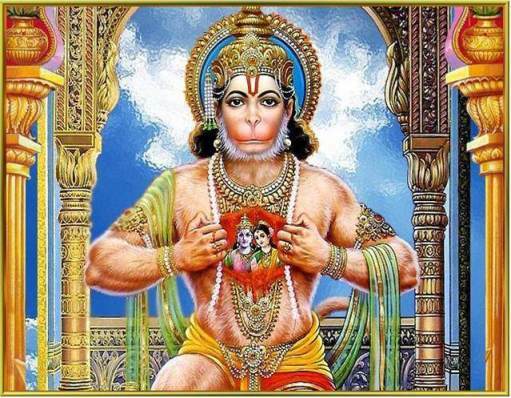 He resides in the heart of His devotees. He punishes those who harm His devotees. He is the Ruler and supporter of all the Devas. He is Adi-deva, the Foremost amongst all the Devas. He is the Lord of the Universe and the Supreme Controller. He protects the Devas, sustains them. He is the Guru for the Devas imparting the Vedic knowledge. ‘Gabhasti’ means a ray or a beam of light and ‘Nemi’ means a rim or the perimeter of a wheel. Thus Gabhastinemih literally means a wheel of radiation. Sri Adi Sankara interprets this name as ‘Gabhasti Chakrasya Madhye Sooryaatmanaa Sthita iti Gabhastinemih – He shines as the Sun at the centre of the circle of rays in the Solar system’. In Sandhya Vandanam we chant the mantra ‘Dheyas sadaa SavitriMandala madhyavartee – The one residing at the centre of the Solar system has to be always meditated upon’. He enlightens everything by His effulgence and He is at the centre of the planetary system as the Sun. 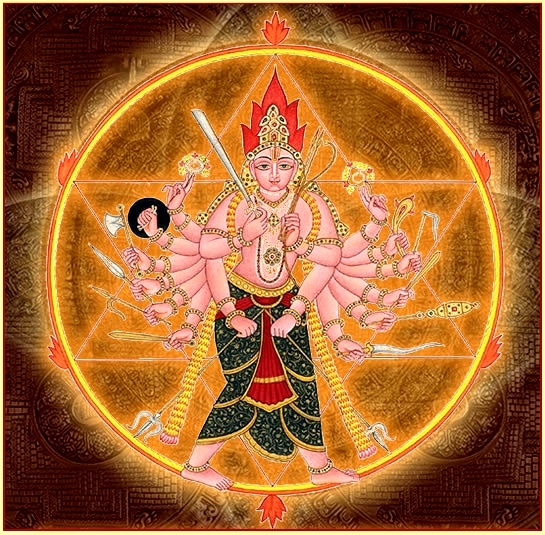 Sri Bhattar’s interpretation is “Gabhastih deepyate jyotir-mayam, nemi-lakshitam chakram yasya iti Gabhasti-Nemih – He possesses the effulgent Chakra. His Chakra is ‘Bhaasvara-Sahasraara-Chakrah – the effulgent Chakra with a thousand spokes’. Yama and Yama-dhootas don’t even come anywhere close to those who bear the mark of Chakra on their bodies, since their saviour is Gabhasti-Nemih who has as His weapon the thousand-spoked effulgent Sudharsana Chakra. பாயச் சுழற்றிய ஆழிவல் லானுக்குப் பல்லாண்டு கூறுதுமே. Meaning: Branded with the radiant discus blazing with the brilliance of fire who swirled the discus at Bana Asura who was waging a war of illusion and made his thousand shoulders bleed. We stand and serve, generation after generation and sing in your Glory. 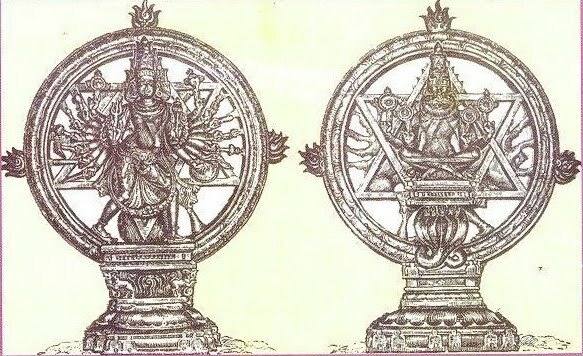 The Chakram in Bhagavan’s hand denotes the Dharma Chakram which controls, guides and directs everyone towards the path of Dharma, and is the Kaala Chakram which shows the never-ending nature of time which is His manifestation (per the writer in Dharma Chakram). Sri Satyadevo Vasistha derives the meaning of Gabhasti from the root words ‘bhas bhartsana deeptyoh – to censure or to shine’. The word ‘nemi’ is derived from the root words ‘nee praapane – to lead’. Nemi also means “the circumference or rim of a wheel”. Thus Gabhasti-Nemih means He who by His effulgence enlightens everything. We know that the Sun gives light to everything. 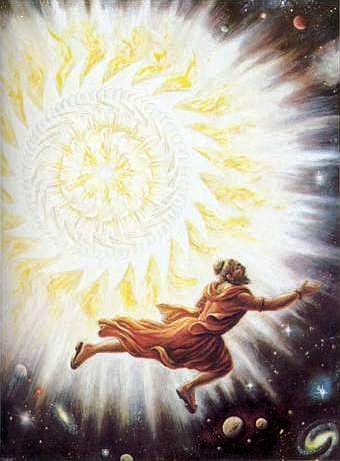 But it is Bhagavan the Gabhasti-Nemih, who gives light to the Sun. He is Brihad-bhanuh or “many Suns in one”. Meaning: He is the Orb that gives light and heat to the Sun. He is Aditya and He is the abode of Rig Veda. The flame which is shining in the orb of the Sun is the collection of Saman chants. He is the person in the flame within the orb of the Sun. Meaning: One should meditate on the form of Lord Narayana situated in the orb of the Sun. He is seated on a Lotus, with golden bracelets, crown, shark earrings; He has golden complexion, and holds the Shankha and Chakra in His hands. Sri Adi Sankara gives two interpretations for this Nama. He says ‘Sattvam Gunam prakaashakam Praadhaanyena Adhitishthati iti Sattvasthah – He who chiefly presides over the quality of Sattva Guna which is radiant’. Of the three qualities of beings (Tamas Rajas and Sattva), Bhagavan stands for Sattva representing pure goodness and nobility. In the Bhagavad Gita Chapter 10 Verse 36, Lord Krishna says ‘Sattvam Sattvavataam Aham – I am the quality of Sattva in the good people’. 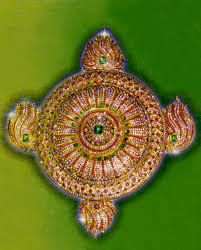 His alternative interpretation is ‘Sarva praanishu tishthati iti vaa – He resides in all beings hence He is Sattvasthah’. The word ‘Sattva’ also refers to all beings, ‘Stha’ means residing, and therefore Sattva-sthah means that He resides in all beings. Sri Parasara Bhattar points out that when Bhagavan is in the heart of the devotees, there is no Karma in them since darkness does not exist where there is Sun. The Nirukti description for this Nama is “Sattve hridi sthitatvaat sa Sattvasthah Samudeeritah – As He stays in the heart of Hs devotees, He is known as Sattvasthah. Meaning: When Lord Hari, who is imperishable and eternal, and who wields the discus and the mace, abides in the heart of a person, how can sin exist there? Meaning: He stays in the hearts of His devotees with His Chakra and thus makes sure that Yama and Yama-patas don’t come near them. In the Dharma Chakram, the writer says that of the three Gunas that are reflected in everyone, Sattva Guna is the one that results in the clarity of mind necessary for realising the Absolute Truth. The food we eat, the thoughts we entertain, etc., should all be directed towards development of this Sattva Guna in us. Participating in Satsang, observing Japa, Dhyaana (early morning), performing one’s nitya karmas (like Sandhya Vandanam), act with the welfare of the fellow-beings in mind etc., are habits that will foster the development of Sattava Guna in us. This Nama teaches us that leading our life in a Dharmic way with Sattava Guna is the path to the realisation of Bhagavan. Sena Nayi was a barber by profession who lived near Pandharapur. Sena, a very pious and god loving person, used to get up early in the morning and after his bath, perform his prayers to Lord Vittala before commencing his daily chores and work. Sena was also the King’s barber and would have to go to the palace whenever the King required his services and called him. One day as Sena was performing his prayer in his home, the King’s messenger came looking for him. Sena was immersed in his prayers. His wife knew that Sena would not entertain anyone during his worship to Lord. She politely told the King’s messenger that he was not at home. Sena’s neighbor who was also a barber on seeing his wife lying, quietly went and informed the King, that Sena was very much at home while offering himself to do the job as his replacement. The King, on learning this, got furious and sent his guards to arrest Sena. 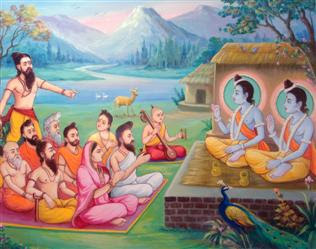 To protect his ardent devotee, Lord Vittala instantly appeared in the form of Sena in front of the King. The moment the King saw him, his anger dissipated. He got attracted to his magnetic personality and without batting his eyelids he was watching the beautiful form of Sena smiling cheerfully and with the shaving kit. When Sena touched the King to shave him, the King felt something unique, a sudden sense of serenity spread within his body from the soothing touch. He watched Sena without uttering any words as the charm attracted him so much and he felt Sena’s glance very divine. Sena went on with his job and washed the King’s head. The King felt heavenly and the divine fragrance mystically drifted the king’s thoughts took the King to top of the world. The King felt very happy and complimented him that he was the best barber in town. Sena then started applying the fragrant oil to the body of the King. As Sena scooped the oil from a bowl, the King could see the reflection of Lord Vittala in the oil. He was amazed on seeing this and was unable to understand this strange yet divine phenomenon/ experience. That cheerful divine smile made him ecstatic, yearning to see more of his form. He was engrossed in the divine silhouette of the Lord that he saw in the bowl and went into a trance. Finally, the spell was broken as Sena completed his job. The King was so pleased with him that he gave him a bagful of gold coins. Lord took the bag of gold coins and placed it in Sena’s house and disappeared. The King was in a state of bliss all day and in the evening commanded his servants to get Sena yet again. The Royal guards immediately went to Sena’s house and asked him to accompany them to the palace immediately. Fearing King’s wrath, Sena was too scared to see the King for his act of not reporting to the King when summoned in the morning. Taking his kit, Sena went to the palace with the guards. On seeing Sena entering the palace the King got up and greeted him. Sena was all confused as he was expecting a severe reprimand. Instead the King asked him to reveal that divine form he exhibited in the morning while shaving. Sena was perplexed as he didn’t go the palace that morning. He fervently prayed to Lord Vittala for His guidance. The King ordered his servants to bring the bowl of oil and saw Sena’s reflection in it, but was disappointed that he could not see the form he had seen in the morning. Sena immediately understood what had transpired that morning. His eyes were filled with tears and sobbing uncontrollably, he told the King that it was Lord Vittala who had graced him. He was sad that the Lord had to take his role to save him from the King’s punishment. The King hastened to console Sena and thanked him for his devotion. He told him that he was fortunate to have had the Darshan of the Lord only due to Sena’s Bhakti. Sena prayed to the Lord to show his divine form to the King in the bowl of Oil once again and the Lord willingly obliged. The King became an ardent devotee of Lord Vittala from that day. Later, Sena saw the gold coins that Vittala had left at his home and distributed them to the poor. 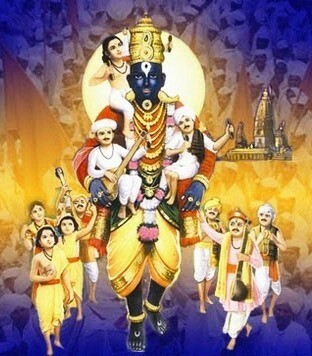 Sena took leave from the King’s duties and decided to serve the Lord permanently at Pandharapur. All glories to Lord Vittala! Sri Adi Sankara’s earlier interpretation for this Nama was that Bhagavan is the Destroyer of sins. His interpretation for the current Nama is ‘Vikramashaalitvaat Simhavat Simhah – He is Valiant and Powerful like a Lion hence He is called Simhah’. The Lion is called the King of the forest because of its bravery. By calling Bhagavan as Simhah we are invoking His bravery and courage. His second interpretation is ‘Nrishabdalopena Satyabhama Bhama itivad vaa Simhah – It is a short form of Narasimha just like Bhama is a short form of Satyabhama’. By this interpretation Simhah is only a shorter name of ‘Half Man-Half Lion’ Narasimha Avataar of Sri Mahavishnu. Sri Bhattar had interpreted this Nama earlier (Nama 202) as referring to Bhagavan’s Narasimha Avataar. For the current Nama, his interpretation is that Bhagavan protects His devotees by punishing those who try to harm His devotees. He punishes Yama and his dhootas if they approach a Vaishnava Bhakta with the intent of harming His devotee. Sri Radhakrishna Sastri suggests that Bhagavan is the Lion that gets rid of the Asuras which are in the form of a deer. Isn’t it Asuras’ in the form of a Deer? 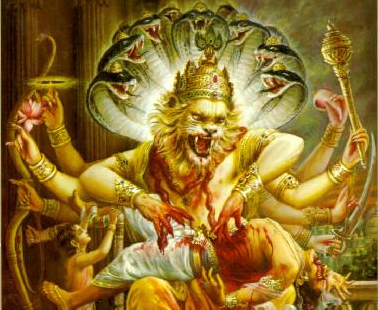 Bhagavan is the Kesari of all Kesaris (Lions). Sri Sankara interprets the Nama as Bhutanaam Mahaan-Isvarah – He is the Supreme Lord of all beings hence He is Bhuta-Maheshvarah’. His alternate interpretation is that ‘Bhutena – Satyena, sa eva ParamAtma Mahaan Ishvara iti Bhuta-Maheshvarah is that He is truly the Supreme and the greatest Overlord of all’. In the first explanation Bhuta is used in the sense of all beings and in the second explanation it is used in the sense of a reality or a fact. 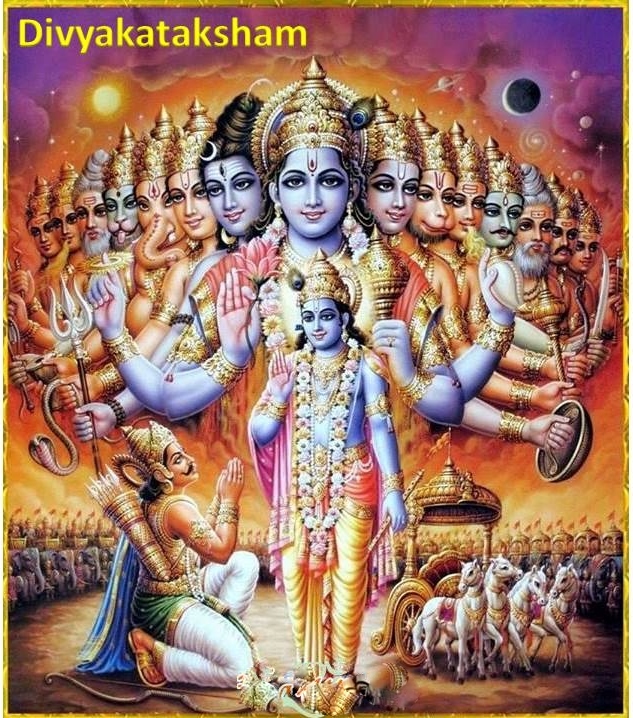 Sri Bhattar’s interpretation is that Bhagavan is the Supreme Lord of all beings as evidenced by His being the Creator of all beings including Brahma. Peria appanai, Piraman appanai, Uruttiran appanai, Munivarkku uriya appanai, Amarar appanai, Ulagukkor tani appan tannai – He is the Father and Lord of all including Brahma, Rudra, the Sages, all the Devas, and everything in all the worlds (Thiruvai Mozhi 8.1.11). Meaning: Fools deride Me in My divine human form, unable to comprehend My Supreme nature as the Ultimate Controller of all living entities as the Bhuta-Maheshvaram. Meaning: Who by His grandeur has become Sole Ruler of all the moving world that breathes and slumbers. Meaning: Who is the Lord of all beings in whom the world is rested, Who Himself is great, and controls the Universe, that is Me. Meaning: From the beginning is God, the cause of elements. He is the One Lord of the Universe, Who upholds both the Earth and the Heaven. He is to Whom we should offer our prayer. This Nama occurred earlier as Nama 335 (Shloka 36). Sri Adi Sankara explains this as ‘Sarva bhootani Aadeeyante anena iti Aadih. Aadishchaasau Devashcha iti Adidevah – Ultimately He absorbs all beings and so He is Aadih. He is also a Devah, so He is called Adidevah’ – the Foremost Deity. 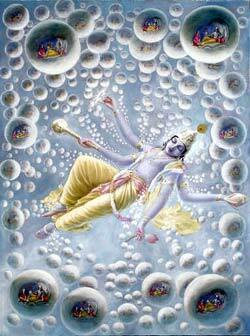 He swallows the three worlds at the time of Pralaya (Deluge), and releases at the time of Creation. Sri Parasara Bhattar interprets this to mean Adi – The Cause and Deva – the ever-shining. Sri Bhattar’s says ‘Adih Dyotamaanashca Adi-devah’ meaning He is the Cause of all the other Gods, and is possessed of great Splendour that subjugates them. He gives an example of this – Bheeshaasmaat vaatah pavate – The wind blows out of fear of Him (Taittiriya – Ananda Valli 8.1). Swami ChinmayAnanda treats Adi as the qualifier for Devah, and gives the meaning that Bhagavan is the First Deity. Sri Satyadevo Vasistha gives the interpretation that Bhagavan is Adi-Adatte grasati jagat-pralaya kaale sa Adih – He who swallows the worlds at the time of Pralaya (Deluge), and Deva-datte visrijati ca bahih sarga kaale sa devah – He who releases the beings from Him at the time of Creation, and so He is Adi-devah. The Dharma Chakram writer remarks that this Nama indicates that Bhagavan is not governed by nature as we know it, where everything has an origin – e.g., the tree comes from the seed, and the seed comes from the tree, the Devas come from Bhagavan, but He is Adi-Deva who has no origin. Everything that is created has an end, but He has no end. Even the Gods can’t comprehend Him fully. We have an origin and an end; we can’t fully comprehend Him who has neither an origin nor an end. The more we meditate on the significance of the Nama Adi-Devah, the more we are closer to realising Him. Sri Adi Sankara’s interpretation is ‘Sarvaan Bhaavaan parityajya Aatma jnaana yogaishvarye mahati maheeyate tasmaat uchyate Mahaadevah – He is above all other feelings and is endowed with pure wisdom and all forms of divine wealth which raises Him to a level higher than other Devas and hence He is called Mahadevah, the Supreme Deva’. Sri Parasara Bhattar interprets that the word ‘Devah’ is derived from the root ‘div-kridaayaam’ meaning ‘to play’. He is Superior to all the Gods and for Him they are like play things. This indicates His Lordship over all the other Gods. Sri V.V. Ramanujan gives reference from NammAzhwar’s Thiruvai Mozhi 3.10.7 – Inburum iv-vilaiyaattudaiyaan – He enacts His Leelas that are endearing and bring us closer to Him. Swami Desikan points out that with His Inbam or Leela He gives us all the means to reach Him. His Arcaa Rupa which is close to us and His bestowing on us the Chaitanyam, the ability to think and understand what is good for us, yet we fail to use any of these means that He has given us and go astray. This amuses Him, and this is the krida or Leela is implied here. Since He performs His great Leela of Creation etc., using all the Gods that He has created such as Brahma, He is Maha-devah. Swami ChinmayAnanda explains that since all the other Gods came from Him, He is the Maha-deva or Supreme Lord or Great Deity. Sri Satyadevo Vasistha uses the meaning Mah – pujaayaam – to honor, and interprets the Nama’s meaning as “He who is fit to be worshipped to the exclusion of others”. He gives examples of the stars losing their importance as soon as the Sun appears, or the AtmA being of Supreme importance in the context of the indiryas which are like the Devas. Sri Adi Sankara interprets this as ‘Praadhaanyena Devaanaam Eeshah Deveshah – He is the Leader of all Devas because of his importance and superiority over the other Devas hence He is called Deveshah, the Lord of the Devas’. Swami ChinmayAnanda explains as Devaanaam Isah Deveshah – He is the very Consciousness in all the other Gods”. Consciousness here can be interpreted to mean “AntarAtma”. He is the God of all the Gods and everything else that exists is because of Him. Meaning: The Lord of Celestials, the Lord of Vaikunta, my own Lord, Himself became the Cause of the three – Brahma, Siva, Indra – within him. He Caused the Celestials, the Sages, the living and all other beings and then appeared in the deep Ocean sleeping on a Serpent couch. Sri P. B. Annangar Acharya Swami elaborates that since Bhagavan is the one who assigns the other Devas such as Brahma their respective functions, He is the Isa or Lord for all the Devas. Yo deveshu adhi-deva eka AsIt kasmai devaya havisha Vidhema – Rig Veda 10.121.8. Meaning: He in his might surveyed the floods containing productive force and generating Worship. He is the God of gods, and none beside him. Who else shall we adore with our oblation? Meaning: Sacrifice was, was manifest among us: it sprang to life and then in time grew stronger. Then it became the deities’ Lord and ruler: may it bestow on us abundant riches. Tamishaanam jagats-tasthushaspatim dhiyam jinvamase humahe vayam -Yajur 25.18. Meaning: We invoke him who may bring us welfare. – Guruh – He who promulgates all knowledge. Sri Bhattar splits the Nama and explains Deva-bhrid as Bhagavan assigning different duties to the various Devas according to their abilities and thus protects them. Sri V.V. Ramanujan gives reference to NammAzhwar Thirvai Mozhi Pasuram 8.1.5 – ManiSarkku devar pola devarkkum devan – Like Devas are God to Men, You are God to Devas. Sri Parasara Bhattar gives the interpretation mentioned earlier viz. Bhagavan is Guruh because He gave the Vedas to the Devas. In the Vishnu Puranam, Brahma is quoted as saying: Hari-Guru-Vashago’smi (3.7.15) – I am under the control of my Guru – Bhagavan Hari. We have from the Sruti – yo vai vedamshca prahinoti tasmai – (Svetasvara Upanishad 6.18) – He who teaches him (i.e., Brahma) the Vedas. Sri V.V. Ramanujan reminds us that Bhagavan is the prathama Acharyan in our Guru-Parampara. He gives two alternative meanings. His first interpretation is ‘Devaan bibharti iti Devabhrit Shakrah Tasyaapi Shaasita iti Devabhridguruh – Indra is called Devabhrit because He protects the Devas but Indra is ruled, nurtured and tutored by Bhagavan, hence Bhagavan is called Devabhrit- Guruh, the Guru of Indra’. The other interpretation is ‘Devaanaam Bharanaat Sarva Vidyaanaam cha Nigaranaat vaa Devabhridguruh – He protects the Devas and He teaches all forms of Knowledge to all and therefore He is called Devabhrid- Guruh’. Bhagavan is the Centre of or fulcrum of the Universe and enlightens everything with His effulgence and hence He is Gabhastinemih. He has the Sudharsana Chakra with a thousand spokes which He uses to control, guide and direct everyone towards the path of Dharma. He is Sattvasthah as He resides in the heart of His devotees. He punishes those who harm His devotees, so He is Simhah. 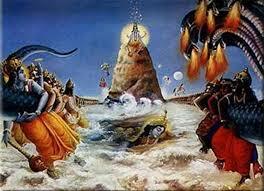 He is the Lord of the Universe and the Supreme Controller, so He is BhutaMaheshvarah. He is Adi-Devah as He is the foremost amongst all Devas. He is Mahadevah as He is the Creator with no beginning or end and hence the Supreme Controller. He is the Ruler and supporter of all the Devas, so He is Deveshah. He protects the Devas, sustains them, so He is Devabhrid. He is the Guru for the Devas imparting the Vedic knowledge, hence He is Guruh. Hari Om! Missed reading this amazing commentary last week. Hats off to your dedication! Greetings to you! Interesting narration yet again. Hari Om Tanisha! Thank you 🙂 God bless you! Hari Om Nirmala ji! God bless you! Pranam Guruji! Missed last week’s bashyam due to my Appaji’s Thithi iin our village. Our whole family thinks of you humbly with respect. Beautiful namas and images sir. The story is also very interesting as usual. May god bless you with good health and happiness always sir. Thank you Lakshmi ji 🙂 God bless you! Hari Om! Hari Om Uncle! Very very beautiful story. I like Sudarshana after reading about that alwar story. The beautiful Chakrat alwar. May Lord Sudharsana bless you! It’s a very powerful Mantra!